Dental veneers can help restore a chipped tooth to it's former beauty. When you're looking for dental veneers in Etobicoke, it's important to find a dentist who knows what they're doing. Professionalism goes a long way when you're dealing with something as important as your teeth. After all, it's what people notice first about us when we smile or talk. Restore confidence in your smile today give us a call about our dental veneer procedures. A veneer is a thin porcelain layer that is shaped to fit over the surface of your teeth. This acts much like a false fingernail fitting over a nail. From time to time a patient may prefer a natural coloured composite material, instead of porcelain. Do I Need a Veneer? Veneers can restore a chipped tooth to its former beauty, creating a uniform shape to your teeth. By improving the shape, position and colour of your teeth, we'll help you create a smile that you're proud to show off. Whether you choose a porcelain or composite material, you can also choose a precise shade. This allows you to improve the colour of a single tooth, or to lighten the front of your teeth. The porcelain or composite material is made to cover the whole front of the tooth, the thicker section of veneer replacing the piece that is broken or chipped. Veneers can also be used to fill small gaps when dental braces are not enough, or not desirable for your situation. On occasion, there is one tooth that is slightly crooked or pushed out in an awkward angle. A veneer can often be fitted to bring it back in line with your other teeth. During the procedure, some of your tooth's outer layer of enamel may need to be removed to ensure the veneer with a permanent bond to the tooth. This sounds worrying, but the amount of enamel removed is such a small amount that it won't cause any problems. The enamel removed will have the same thickness as the veneer that will be fitted, so your teeth will stay a consistent size. A local injection anaesthetic may be used to ensure that there is no pain or discomfort, but this is not necessary. Once your tooth has been prepared for fitting, your dentist will need to take an impression of your teeth. This is accomplished by fitting a mould over your teeth and allowing it to harden. Once the impression is removed, it will hold the shape of your teeth and allow a veneer to be created by a dental technician. The colour of surrounding teeth is then matched on a shade guide to make sure that your veneer will look natural. The entire process of getting a veneer fitted will take a minimum of two visits. The first visit alllows the dentistry team to prepare your teeth and match the colouration of the veneer, as well as creating the impression. The second visit allows your dentist to fit it into place on your tooth. Before the veneer is bonded in place, your dentist will show you the veneer attached to your teeth to make sure you are satisfied with the results. 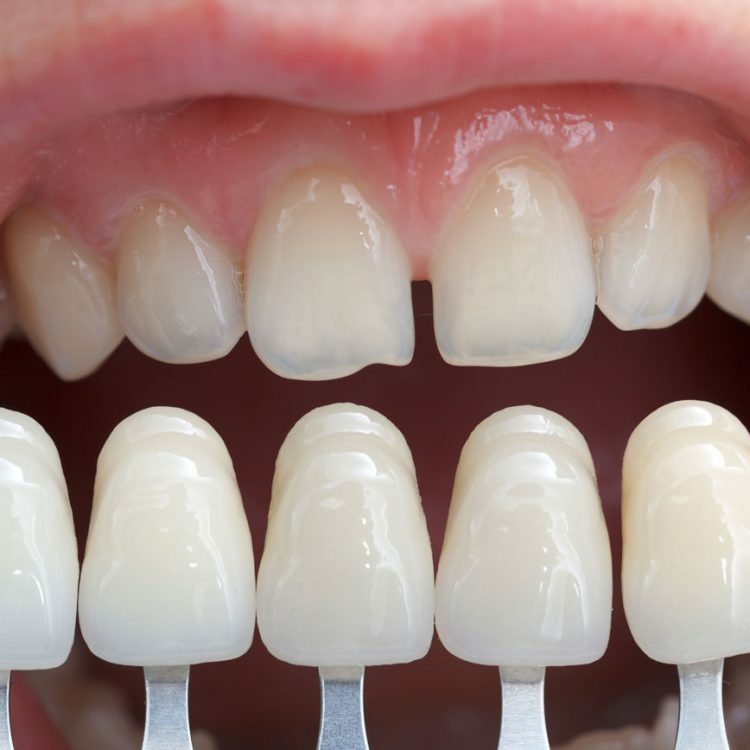 Once it is bonded with a special adhesive, veneers are permanently in place. Keep in mind that veneers can chip just like natural teeth, so be sure to take care of them.